For the lines, I used the Hero Arts Neon Ink that I purchased on sale at JoAnn’s a week or so ago. The ink pads were on sale for $3.89 and they are regularly $6.49 each. After weeks of debating whether or not I really needed these inks the sale pushed me into action. This inks are awesome and the colors are so fun and bright! I am going to share this card on a just for fun challenge at Operation Write Home for their Midweek Throwdown; Tic Tac Toe. My entry is for the diagonal set of Brads, Tags and Embossing. Why not choose a row and play along? 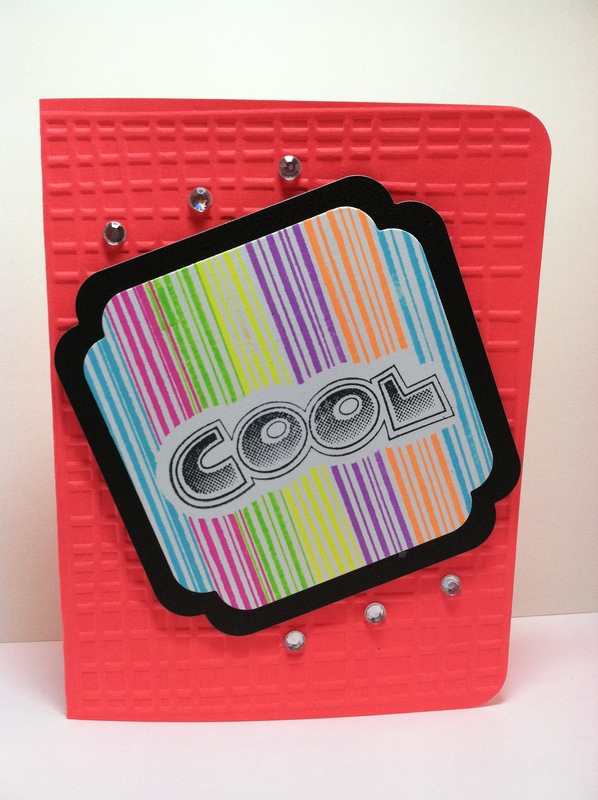 Posted in Any Occasion, Handstamped cards and tagged hero arts neon ink, rainbow. Bookmark the permalink. Oh this makes my day … so glad you put your own spin on the stripes and played around with them. Love the results you got! And, I picked up the neon inks too when they were on sale. Hope to see you next week at CASual Fridays! Thank you so much, Kelly. You’re original idea was so awesome!!! Great stamping! I’ve been debating about the neon inks myself and you’re enabling me to go get them. Putting your image on the black really makes those neon colors pop! The colors were just as pleasing in person as they appeared to be online. I was happy about that because, sometimes colors can be deceiving based on your monitors settings. I hope you enjoy them if you buy them, Erika.